The army has no direct role in conducting the election and nothing can be more heartening than the fact that the Pakistani nation and all the political parties in the country have been involved in taking forward this democratic process, said the director-general of the ISPR, the army spokesperson, Major General Asif Ghafoor. He was holding the press conference to lay out what the role of the armed forces would be on July 25. He said it was to assist the Election Commission. “We have to support them in all the tasks for which they have sought help,” he said. This is not the first time that the armed forces have been deployed in the election process. The armed forces have previously carried out this duty on the orders of the Election Commission. The Election Commission has tasked the armed forces to assist them in the 2018 election as well. “The aim is to conduct the election in a free, fair and transparent manner. We would implement the ECP’s code of conduct.” He said that 375,000 troops are being trained for election duties. It will be ensured that no interference is made in the election process and polling stations have been categorized into ‘Sensitive’ and ‘Normal’. At sensitive polling stations, two soldiers will be inside and two on the outside. The Army personnel will be deployed three days before the election. 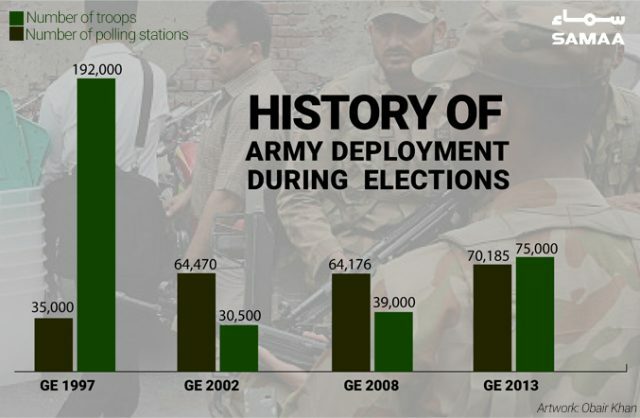 On normal polling stations, the number of soldiers deputed can be reduced. Foreign observers will be given free access in line with the cards issued to them. If they see any discrepancy, they should also inform the relevant authorities. This time around, transport of the printed material is the army’s responsibility. “However, we will not take printed material in our custody,” he said, referring to the ballot papers. Ensuring all of this is the job of the ECP. The armed forces, in line with the ECP code of conduct, will facilitate them to ensure that the elections happen in line with the given mandate. If an armed forces representative witnesses any kind of discrepancy, they will indicate it to the Election Commission, he said. The armed forces have no authority to intervene and fix the said discrepancy. It will be the ECP’s responsibility to fix it. The army will also see to the security of the printing presses during the printing of ballot papers. There are three printing presses: two in Islamabad and one in Karachi. Counting the papers is also the ECP’s responsibility. “Our job is only transporting the material in a safe manner,” he said. “Our job is to provide security to the staff as well.” Transporting the ballot boxes to the ECP’s strong room after the polling is also the army’s job as tasked by the ECP. The voter should be able to exercise their right to franchise without any pressure. The more people who come out to vote, the more transparent the elections will be. “There hasn’t been a single election in the history of Pakistan, when politicians have not made accusations of interference, or when candidates have not switched loyalties,” he said. “It was not possible to get so many soldiers given the situation on our borders,” he said. Therefore, we are training and using the services of the civil armed forces and officers who recently retired in the last five years or so as well. And the Pakistan Navy and PAF troops will also be on duty (around 4,000 each). In total, 371,388 troops will be on duty. In 1997, 192,000 troops were deployed at 35,000 polling stations, he said, sharing some overhead Powerpoint slides. Troops were responsible for security outside and inside the polling stations. Responding to allegations that the PML-N candidate in Multan, Iqbal Siraj, was threatened and harassed by the ISI, Maj-Gen Ghafoor said the spy agency was not involved in any way in this incident. The ISI did not raid Iqbal Siraj’s godown. “We have no reservation regarding any candidate being elected PM,” said Maj Gen Ghafoor, while responding to questions about Imran Khan not being acceptable to the army.